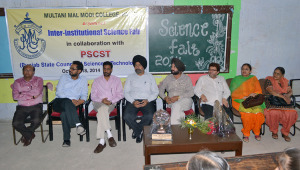 Inter Institutional Science Fair was held at Multani Mal Modi College in collaboration with Punjab State Council for Science and Technology (PSCST), Chandigarh on the eve of Modi Jayanti on 18th October, 2014. A competition was held for Static Models, Working Models and Poster Presentation on the theme ‘Man Development and Disasters’. 25 Teams from schools 15 teams from colleges participated. 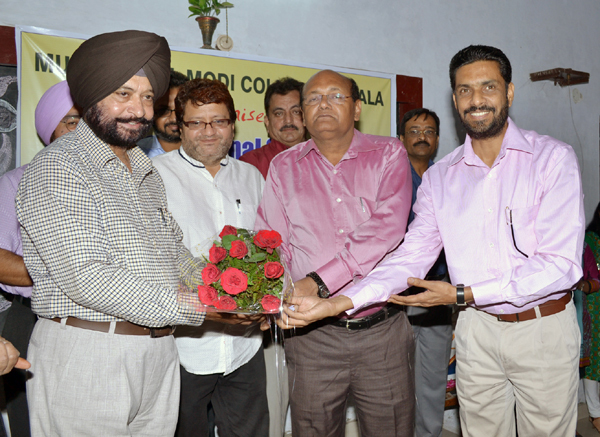 Dr. Khushvinder Kumar, Principal welcomed the Chief Guest, Judges and teachers of various competing institutes. Dr. Vinay Jain, Dean Sciences spoke on the theme i.e. Role of Man in Recent Disasters. Chief Guest Dr. Gurmail Singh of Punjabi University, Patiala appreciated efforts of the students and encouraged them to participate in such events and spread the message of importance of environment and adopt in their life style. 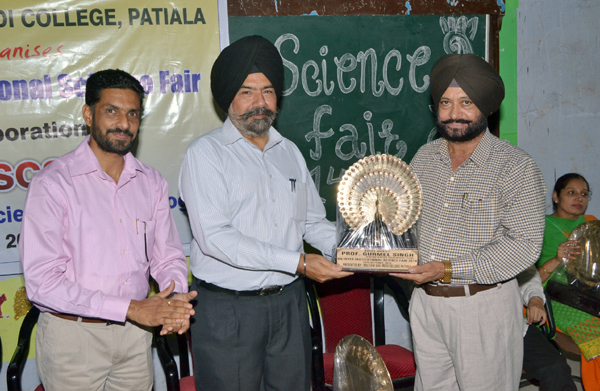 Dr. Baljeet Singh, Dr. Anureet Pal, and Dr. Gurmail Singh judged the performance of college section. 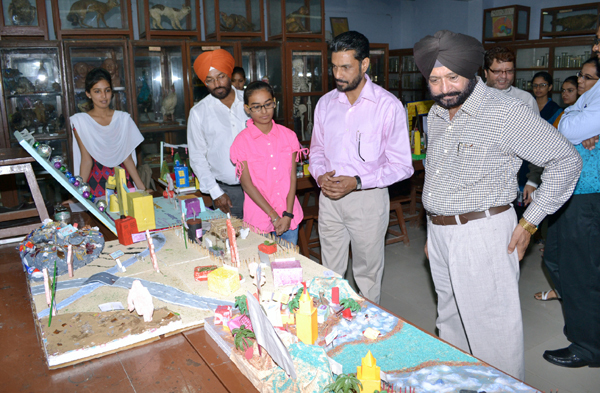 Whereas Dr. Neena Singla, Dr. Karamjeet and Dr. K K Garg judged the performances of school section. In Poster Presentation, Yadvinder and Rashpreet of D.A.V. Public School, Patiala got 1st position, Arshdeep Kaur and Harsimran Kaur of Guru Nanak Foundation Public School, Patiala and Lovepreet Singh and Gurdeep Singh of S.D.S.E. Sr. Sec. School, Patiala bagged 2nd position and Savneet Kaur and Gurleen Kaur of Guru Nanak Foundation Public School, Patiala and Akansha and Ramandeep Kaur of D.A.V. Public School, Patiala got 3rd position. In Static Model Category, Prabhsimran Singh and Shivam Rana of Guru Nanak Foundation Public School, Patiala bagged 1st position, Pratibha Nanda, Khushpreet Kaur, Abhishek and Gurnoor of Shivalik Public School, Patiala got 2nd position and Simranjit Kaur, Meheep and Sukhmeen Kaur of Shivalik Public School, Patiala got 3rd position. In Working Model Category, Vardaan and Yupesh Grover of Shivalik Public School, Patiala bagged 1st position, Sanyam and Abhay Bansal of Kaintal Public School, Patiala got 2nd position and Shivam Kumar and Lovish Mittal of St. Peter Academy and Vaibhav and Harjot of Kaintal School, Patiala got 3rd position. 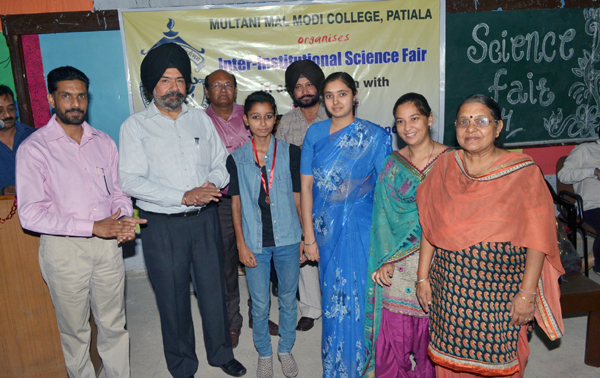 In Poster Presentation, B.C.M College of Education bagged 1st position, Ravnee Kaur and Sargamdeep Kaur of Multani Mal Modi College, Patiala got 2nd position and Manpreet Kaur and Medha Sharma of Multani Mal Modi College, Patiala got 3rd position. In Static Model Category, Prabhjot Kaur and Deepshika of Mata Sahib Kaur Khalsa College for Girls got 1st position, Romi and Amandeep Kaur of Govt. State College of Education, Patiala bagged 2nd position and Shreya Sharma and Savi Jain of Multani Mal Modi College, Patiala got 3rd position. In Working Model Category, Gurinder Kaur and Jasmeet Kaur of Mata Sahib Kaur Khalsa College of Girls got 1st position, Vivek Robert and Yadwinder of B.C.M. College of Education got 2nd position and Harmandeep, Simrandeep Kaur, Jaineeth Rathour and Nitika of Multani Mal Modi College, Patiala got 3rd position. In the evening session Dr. M.I.S. Saggoo, Professor and Head, Department of Botany was the Chief Guest for valedictory function. Dr. Ashwani K. Sharma convener of the function welcomed the guests. Dr. Khushvinder Kumar spoke on this occasion highlighting the achievements of the college in general and science students in particular to win laurels in the field of academics and extra co-curricular activities. Organising Secretary Dr. Rajeev Sharma conducted the stage and Dr. Meenu presented the vote of thanks. All staff members were present on this occasion.